After a second-place finish in the Air Force Research Laboratory’s Nanosat-7 competition in January, S&T’s Missouri Satellite (M-SAT) team is already working on the next two-year design and build competition, Nanosat-8. This time the team is focusing on enhancements to the current design. Jacob Darling, chief engineer responsible for developing, designing, testing and integrating the Nanosat-7 satellites, agrees. “We’ll stick with what was done, but we’re looking at adding infrared cameras and upgrading the communication system to a higher speed transmitter so the images download faster,” he says. The team’s two microsatellites are designed to launch as a single unit, separate once in orbit and maintain a specific flight formation. Both students hope to work with satellites after graduation. Darling is interested in being a guidance, navigation and control engineer, and Dunn would like to work for a company with a human space flight component. Nanosat-8 will be the pair’s third run at the competition — they were undergraduates the first time. This time they’ll serve as mentors, with their “deputies” from the previous competition taking the lead. They say that being on the team has been a great experience and that they valued the opportunity. A lot of our students will get jobs and internships with AFRL and other companies because of this experience,” says Dunn. 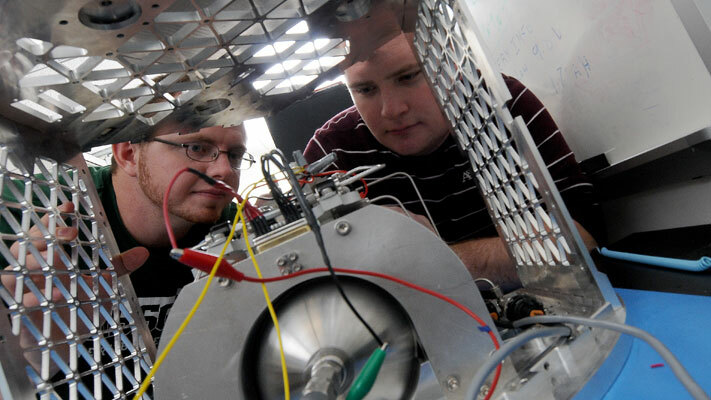 Learn about mechanical and aerospace engineering at Missouri S&T. I am glad that this is being done. It sounds so great that S & T is doing so good in this competition. I hope all goes well.